During World War II, Nazi Germany systematically looted occupied Europe. After the war ended, the Allies attempted to locate the art, gold, and other items in order to return them to their proper owners. How successful were they? Does any of this Nazi treasure remain lost today? Or did it escape into the clutches of ODESSA? So, during World War II, Germany conquered much of Europe. While occupying this enormous territory, the Nazis looted on an unprecedented scale. Public and private collections of gold, silver, jewels, paintings, ceramics, and other items were stolen and transported to the Museum Jeu de Paume in Paris. After examination and cataloging, the plunder was forwarded to Germany. Some of these items were intended for the never-built Führermuseum, which was a planned museum complex for Linz, Austria and a fascinating story in its own right. Other things were appropriated by officials or traded for wartime funds. Initially, most of the plunder was stored in Paris or Munich. However, as defeat became inevitable, the Nazis began to hide artwork and other relics in salt mines, tunnels, caves, and castles. This protected them from bombing raids while also keeping them hidden from the advancing Allied forces. At the same time, Nazi officials were growing increasingly worried. The war was coming to an end and it was only a matter of time before they would be tried for war crimes. Out of this fear sprouted ODESSA (Organisation der ehemaligen SS-Angehörigen). ODESSA was an organization formed by SS officers in 1946. Its purpose was to help fugitive SS members escape to sympathetic countries in South America and the Middle East (this network may have even helped Hitler fake his death and escape Germany). There is some debate about whether ODESSA was a single, centrally-planned organization or a series of loosely-connected groups. Regardless, it’s believed that as many as 10,000 SS members escaped in this fashion. But ODESSA wasn’t just used for escape. Scholars believe it was also used to move Nazi plunder out of Germany. This plunder may have been intended to fund a sort of “Fourth Reich” consisting of remote Nazi colonies in other countries. Regardless, over 100,000 objects remain missing today. Although a large portion of this sum consists of low-value items, many important and valuable objects have yet to be found. The full extent of ODESSA will most likely never be known. The same goes for the location of much of the missing Nazi plunder. However, in Chaos, I provide a little speculation on the former and a possible answer for the latter. That’s right. A gigantic Nazi treasure is buried deep underground, somewhere in the maze of tunnels that rests beneath Manhattan. Recovering it seems easy…until things go very, very wrong. That’s it for today. Tomorrow, we’ll be taking one step deeper into the mysterious world beneath New York City. But not to visit the tunnels. Instead, we’ll be looking at the denizens who reside there…the legendary Mole People. I hope to see you then! November 13: What’s Next for Cyclone Reed? Immediately following World War II, America’s Office of Strategic Services began to quietly recruit former Nazis via Operation Paperclip. What was the purpose of this program? And why does it rank as one of the most controversial programs in U.S. history? During World War II, Nazi scientists developed an impressive level of technical expertise, which manifested itself in a series of brilliant war-time inventions and weapons. As the war drew to a close, American officials began to realize that this knowledge could be extremely valuable in the post-war world. At the same time, with the Cold War looming, they also wished to keep it out of Russian hands. Unofficially, American recruitment of Nazi scientists began shortly after Germany’s surrender on May 8, 1945. It wasn’t until August that President Harry Truman formalized Operation Paperclip. His order expressly forbade recruiting anyone who had been “a member of the Nazi party and more than a nominal participant in its activities, or an active supporter of Nazism.” Background investigations were to be conducted by the newly-established Joint Intelligence Objectives Agency (JIOA). Wernher von Braun: Member of the SS and held the rank of major under Hitler. Helped design the deadly V-2 rocket. After coming to America, he worked on the IRBM program before joining NASA. He was chief architect of the astonishingly successful Saturn V launch vehicle, which helped land Neil Armstrong, Buzz Aldrin, and Michael Collins on the moon. Arthur Rudolph: Operations Director of the Millelwerk factory where 9,000 workers died from exhaustion, 350 were hanged, and another 10,000 or so died from disease, starvation, or execution. After coming to America, he helped Wernher von Braun develop the Saturn V rocket. When the truth of his wartime record came out, he agreed to leave America and renounce his citizenship in 1984. These three men are believed to be just the tip of the iceberg. Proponents of the program justify the illegal recruitments by pointing to their numerous achievements, such as Saturn V. However, there was a dark side to the program as well. Between 1950 and 1974, Operation Paperclip scientists conducted experiments on U.S. soldiers at Edgewood Arsenal. Participants were exposed to chemical and biological agents as well as LSD, THC, and BC. The three latter substances were part of a top-secret CIA mind-control project known as MKULTRA. The morality of Operation Paperclip remains a hotly-debated topic even today. But regardless of your feelings on it, it’s a part of American history that deserves to be told. Operation Paperclip doesn’t play a giant role in Chaos, at least not directly. However, it enabled a brilliant and mysterious physicist named Dr. Karl Hartek to come to America, setting in action a course of events that lead to devastating consequences. Chase lifted an old color Polaroid from the desk and passed it to me. The faded image depicted a strange-looking fellow, with puffy eyes, a bulbous nose, and misshapen shoulders. Sort of like the love child of an ostrich and an ape. Only Cy Reed, a former urban archaeologist turned treasure hunter, is capable of undoing the potential disaster wrought by Dr. Hartek’s strange invention, die Glocke. That’s all for today. Make sure to come back tomorrow when we’ll be discussing two more topics that play crucial roles in Chaos…namely, lost Nazi treasure and the mysterious ODESSA program. I hope to see you then! On June 8, 2007 author Robert Kurson wrote an op-ed for the New York Times, arguing the merits of treasure hunting. It was the latest salvo in a war that stretches back for decades. Was Kurson right? Or are his critics correct that treasure hunting is immoral and that it, along with the black market antiquities trade, should be criminalized? “1. Can treasure hunters do archaeology with high standards? The above argument seems powerful at first. But upon closer inspection, it’s shown to be fatally flawed. I don’t doubt that “careful excavations” are more expensive than treasure hunts. But this doesn’t necessarily imply they produce better work. In general, non-profit operations pay far less attention to the cost side of the equation than profit-seeking ones. So, this might really be nothing more than better cost management on the treasure hunting side. These artifacts aren’t being researched nor are they being put on public display. And this isn’t unique to Crimea. Similar scenarios take place across the globe. Still, the archaeological position remains consistent. Treasure hunting is an immoral activity and should be treated as such. Thus, archaeologists have sought the assistance of governments in order to quell the activities of hunters. Is there a way to solve this endless debate? One particularly innovative suggestion comes courtesy of the Ludwig von Mises Institute. In his article, “In Defense of Tomb Robbing,” Adam Young suggests that one solution is to, in essence, “privatize archaeology.” He argues that this would force today’s treasure hunters to acquire greater excavation skills in order to sell artifacts to “museums, universities, and private collectors.” In other words, if “archaeological entrepreneurs” were able to sell their wares freely, they would have greater incentive to do better work in order to fulfill the demands of their customers (i.e. museums). Also, in the absence of antiquities laws, private owners would be more likely to share their artifacts with researchers, especially since subsequent research might increase the value of the artifact in question. Interestingly enough, his points can be seen today. Shipwreck hunting is, in most cases, legal. This has given rise to companies like Odyssey Marine Exploration, a for-profit corporation that salvages deep sea wrecks. Unlike black market treasure hunters, Odyssey is a highly professional organization. It employs distinguished archaeologists, performs meticulous studies, and even publishes books and reports on its findings. Some archaeologists say this is not enough. They point to Filipe Castro, who excavated a merchant ship off the coast of Portugal. Castro has “published two scientific books and 26 articles on the wreck, and has completed six archaeological reports.” Perhaps they are right (or perhaps Castro is guilty of severe over-analysis). But regardless, Odyssey has clearly found value in conducting its own scientific research. The Treasure Hunting vs. Archaeology debate is one I doubt will ever end. Although Odyssey does more scholarly work than any treasure hunting company in history, they are still scorned by the vast majority of archaeologists. Personally, I find the debate fascinating and it served as inspiration for the creation of my hero, Cy Reed. Cy Reed is a former urban archaeologist who used to work in Manhattan. Due to a terrible tragedy, he decided to uproot his life and becomes a nomad, working as a treasure hunter. At the beginning of the book, he returns to Manhattan in order to search for a missing friend. He is forced to attempt to reconcile the two sides of his soul: the archaeologist and the treasure hunter. Needless to say, this inner conflict drives much of his actions. That’s it for today. Make sure you come back tomorrow when we’ll delve into a piece of strange history…namely, a highly controversial Allied World War II project known as Operation Paperclip. I hope to see you then! On August 8, 1963, a crew of 17 men hijacked the Royal Mail train in Buckinghamshire, England. After taking the train to Bridego Bridge, they removed £2.6 million from it. Then they vanished into the night. Were they captured? And what happened to the money from the Great Train Robbery? So, in the wee hours of the morning of August 8, 1963, conductor Jack Mills stopped his Royal Mail train at a mysterious red signal. His second, David Whitby, attempted to call the signalman from a nearby telephone only to discover that the line had been cut. Suddenly, fifteen robbers swarmed the locomotive. They forced Mills to drive the train to Bridego Bridge and proceeded to attack the “High Value Packages” carriage. Guards offered some resistance but were quickly overwhelmed. Over the next twenty-five minutes, the robbers unloaded 121 mail sacks from the train and brought them into a waiting truck. The sacks contained £2.6 million in bank notes (roughly £40 million or $63 million in today’s money), many of which were going to be removed from circulation due to old age. The robbers transported the money to Leatherslade Farm, which was located about 27 miles from the scene of the crime. They divided it into 17 shares (15 robbers, 2 informants) and used it to play Monopoly. Soon after, they fled the farm but they left behind plenty of fingerprints which were discovered by the police. By December, police had arrested nearly a dozen of the robbers as well as numerous associates. The ensuing trial was marked by controversy. One robber was freed for lack of evidence. The other ten robbers, for the most part, received 20-30 years in prison, far longer than the typical sentences handed out to murderers. Most egregiously, two innocent men were wrongfully convicted and given stiff sentences for a crime they didn’t commit. Out of the original £2.6 million haul, about £0.4 million was recovered. The location of the remaining money has led some to believe that there is a hidden fortune, still waiting to be discovered. This is possible but unlikely. Most scholars believe that this money was spent fleeing the police or paying for lawyers. Also, large portions were probably spent by family members or were stolen outright. The Great Train Robbery remains a partly-unsolved mystery. At least four participants were never captured. There is also the matter of the missing money, assuming that any of it is still around. The Great Train Robbery of 1963 was a monumental crime and has inspired countless books and films. On a more personal basis, it served as a partial inspiration for the prologue of Chaos. “A loud high-pitched shriek reverberated across the tunnel, ping-ponging from wall to wall. Jenson glanced to his right. The Omega stood quietly in the semi-darkness. Well, that’s it for today. Make sure you come back tomorrow when we will discuss a topic near to my heart…the conflict between Treasure Hunting and Archaeology. I wanted to kick off this book club by telling you a little about myself as well as how Chaos came to fruition. My name is David Meyer and I’m the Guerrilla Explorer. I’m an adventurer as well as an author. Whether hunting for pirate treasure or exploring ancient Pre-Columbian ruins, my love of mystery inspires me to seek answers to the unknown. I’ve always loved to read. And when it comes to fiction, I prefer the action/adventure genre. So, when I decided to try my hand at writing novels, an adventure story was the obvious choice. Of course, that decision came at a cost. 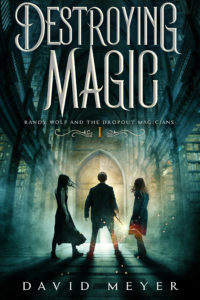 Plot-driven adventure novels are generally disdained by “serious readers.” However, I was far more interested in entertaining readers like myself than appealing to the so-called literary types. The seed for Chaos was planted a few years back when I was tromping through an abandoned subway tunnel with the future Guerrilla Wife (yes, she still married me!). As I passed through a particularly desolate stretch of dilapidated concrete, I found myself wondering: What if someone hijacked a subway train? It wasn’t the most original question in the world. After all, a similar premise underlies Morton Freedgood’s novel, The Taking of Pelham One Two Three. But while Freedgood saw the subway system as a unique crime scene, I saw it as a “lost world” full of crumbling ruins, dangerous natives, and metal monsters. With that as my starting point, I decided to write a traditional adventure tale with a distinctively modern, urban spin on it. Rather than scale a mountain, my hero Cy Reed scales a mountainous skyscraper. Rather than wading through a vicious river, he’s thrown headfirst into a violent, artificial one. And rather than fighting a typical “secret society” in order to recover some ancient “totem of power,” Cy battles a gang of old sandhogs who are protecting a decidedly, not-so-ancient secret. Even Cy himself is a modern, urban version of the archetypal archaeologist hero. He’s a former urban archaeologist who once worked extensively in New York City. Well, there you have it. Now you know a little about me and my book. Come back tomorrow as we delve into the first of many mysteries that informed the writing of Chaos. Our topic will be the Great Train Robbery of 1963 and a treasure that’s been missing for nearly five decades. I hope to see you there! We here at Guerrilla Explorer wish to extend our thank you to Jennifer over at Book Den for reviewing Chaos. She gave it a 6/10 with some very kind comments about the book as well as this site. If you’re like me and you love watching shows like Ancient Aliens on the History Channel, Chaos is right up your alley. It’s based on some really cool mysteries and science but mixed in with bad guys and monsters. You can check out more about Chaos and the mysteries behind it at David Meyer’s fantastic blog Guerrilla Explorer. You can read her full review here. Thanks Jen! 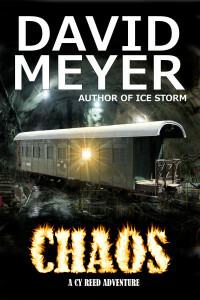 As a reminder, Chaos is an adventure thriller along the lines of Indiana Jones or books written by Clive Cussler, James Rollins, Douglas Preston, or Steve Berry. If you haven’t already done so, please consider picking up a copy at one of the locations below. Thanks for your support! Today marks the official launch of Chaos! Chaos is a thriller/adventure novel that deals with all the things we love here at Guerrilla Explorer…forgotten history…stolen treasure…strange science…and the “lost world” of tunnels under New York City. If you like Indiana Jones or novels by the likes of Clive Cussler, James Rollins, Steve Berry, or Douglas Preston, then Chaos is perfect for you. You can pick up an e-reader version at any of the retail outlets listed below as well as the paperback at Amazon.com. Keep reading for more information on Chaos as well as on our very unique book club, which will be starting in exactly one week. To locate his missing friend, former urban archaeologist Cy Reed must piece together his shattered life and return to the one place on earth he truly fears…Manhattan. Starting one week from today, I’ll be hosting a book club on this site. But it won’t be an ordinary book club. Instead, we’ll be focusing on the shocking mysteries, lost treasures, and unbelievable history that helped to inspire Chaos. Topics and dates are listed below. Spoilers may be revealed so please keep that in mind if you prefer to read at a slower pace. I hope you enjoy Chaos as well as the book club. Thanks for your support! I’m very pleased to announce the official release of Chaos! You can pick up the e-reader version at any of the fine retail outlets listed below as well as the paperback at Amazon. Needless to say, we’re very excited over here in No Man’s Land. This day has been a long time coming. Chaos is a thriller/adventure novel that deals with all the things we love here at Guerrilla Explorer…forgotten history…stolen treasure…strange science…and the “lost world” of tunnels under New York City. If you like Indiana Jones or novels by the likes of Clive Cussler, James Rollins, Steve Berry, or Douglas Preston, then you’re going to love Chaos. Make sure to come back tomorrow when I’ll be unveiling details on the upcoming Chaos book club. Fair warning…this is no ordinary book club. Instead of the usual stuff, we’ll be discussing the shocking mysteries, lost treasures, and unbelievable history that helped to inspire Chaos. You’re not going to want to miss it! If you’re still not convinced, read below for more details on Chaos. Thanks for your support! Tonight at midnight (EST), I’m officially launching Chaos. It’s a thriller/adventure novel that deals with all the things we love here at Guerrilla Explorer…forgotten history…stolen treasure…strange science…and the “lost world” of tunnels under New York City. If you like Indiana Jones or novels by the likes of Clive Cussler, James Rollins, Steve Berry, or Douglas Preston, then you’re going to love Chaos. Just One More Day Until Chaos! Chaos will be available as a physical book on Amazon.com as well as pretty much any place e-books are sold. And you’re going to want to get your copy soon…very soon. Because starting next week, we’ll be hosting a book club here at Guerrilla Explorer. But this won’t be your ordinary book club. Instead, we’ll be discussing the shocking mysteries, lost treasures, and unbelievable history that helped to inspire Chaos. You’re not going to want to miss it. So, as soon as Monday, October 17 comes around, get on your computer and order your very own copy of Chaos. Thanks for your support! Many thanks to Rae at Best O’ Books for reviewing my upcoming novel, Chaos. She gave it four out of five and her comments were exceedingly generous. Mr. Meyer writes a fast-paced, engaging tale that would make an excellent movie. As I was reading, I was imagining the scenes being played out in Hollywood. This book would fall into the genre of adventure, and I would liken it to the Indiana Jones movies. Character development is barely sketched out because the story is plot-driven, and we are only given the details we need to know to further the story. This might not have been the type of book I feel most comfortable reading, but it was still a pleasant read for me and I appreciate the talent of the author and his enthusiasm both in real-life and on paper is contagious. High praise indeed and I appreciate every word of it. You can read her full review here. I’ll be talking quite a bit about Chaos this month. It’s my first novel and filled with all the things we love here at Guerrilla Explorer…treasure, mysteries of history, cryptids, strange science, conspiracies, and the like. You can pick it up pretty much anywhere ebooks are sold and physical copies will be available through Amazon.com. Thanks Rae!